Guardians of the Galaxy Vol. 2 - 4K UHD Review - ReDVDit! Guardians of the Galaxy Vol. 2 was probably one of 2017’s most anticipated films, and as someone who hasn’t enjoyed a single Marvel movie since the first Guardians, it was high on my list for summer blockbusters that I knew I had to see. Although it wasn’t nearly as original or surprising as the first film in the series, as far as sequels go, it was better than anything else so far in Marvel’s Phase Three. There were a few things that stuck out to me as negatives, starting with Star Lord’s arc in the film. While Chris Pratt slayed as Star Lord in the original, his character took a much more serious turn in Vol. 2, and I can’t say I enjoyed it. The first Guardians was really Pratt’s coming out party in Hollywood, and is what made him a massive star, playing the funny, charming lead in action movies all over the screens the past few years. I’d call him this decade’s version of a 90s Will Smith. With the new serious arc, his comedic talents took a back stage, and Dave Bautista took over, playing Drax in a much funnier way than in the first film. Drax really is the standout of Vol. 2, and Bautista should be applauded for the way he handled the character. Rocket Raccoon was same old same old, but unfortunately, Groot was not. While there were still some cute baby Groot moments, it didn’t play as well with me as the bumbling adult Groot from the original. Hopefully teenage Groot (who we get a sneak peek of in the after credits scene) is a huge improvement. Finally, the action stalled a bit for me, and for the first time with this crew, I was a bit bored. The opening sequence is fantastic and sets up what could have been a perfect follow-up, but instead the team at Marvel tried too hard to tell the story about Star Lord’s father, while also interweaving in pieces that will connect to the other Marvel films. Vol. 1 was truly original and an excellent standalone film with plenty of action, but unfortunately Vol. 2 felt too much like the standard Marvel fare, and I don’t think that I speak for myself when I say that I’m bored with the same world-ending storyline being used over and over again. As positives, Vol. 2 is still much, MUCH better than the Marvel Studios films of the past few years (in my opinion it’s been downhill since the original Avengers) and the cast and crew still come off as a very likeable bunch with excellent on-screen chemistry. There are plenty of laugh out loud moments, a terrific “bad guy” with an amazing name, and enough action to keep most people satisfied. It will be interesting to see how much of the Guardians we get to see in the upcoming Infinity War, but I hope they get equal screen time compared to the other Avengers, since they are still the cream of Marvel’s crop. Thank the Blu-ray gods that Marvel and Disney have finally embraced 4K; this transfer is gorgeous. The HDR makes the colors pop like you’d only see in a high-end theater, and the fact that the film was shot in 8K help the resolution. Granted, the film was still finished with a 2K Digital Intermediate, but the 8K source is clearly still making an influence in the 4K UltraHD presentation. The opening sequence looks great, but the real highlight is probably (spoilers) the planet that Peter Quill’s father lives on, and essentially dreams up. The colors in that scene are incredible, and there are plenty of effects which pop in HDR. 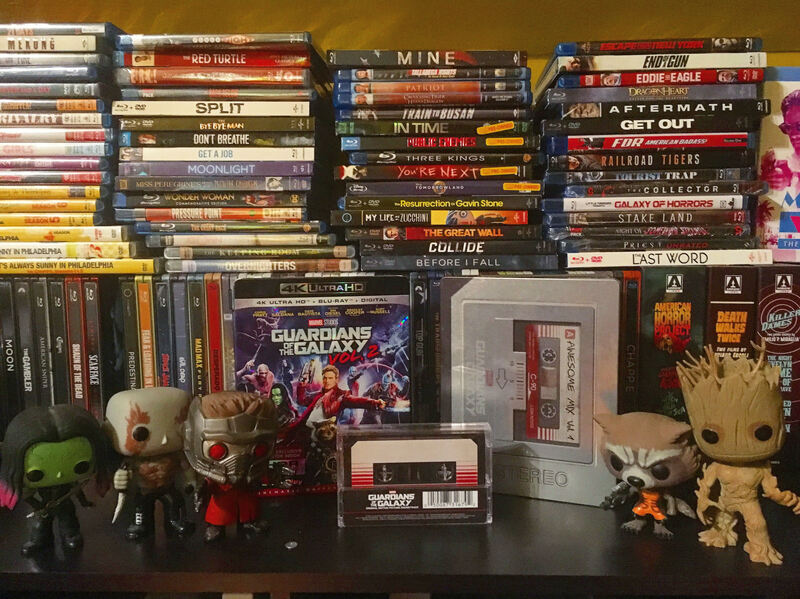 Marvel and Disney have taken a step in the right direction, and especially since Guardians was filmed with Dolby Vision technology included, it was time to take the leap to 4K. Props to them for doing so. Atmos, atmos, atmos; you cannot beat this new sound tech. Dolby Atmos is especially great for space epics like this, since the overhead sound effects are so prevalent and easy to utilize in the mix. The surrounds were equally as impressive, and dialogue was clear as day through the center speakers. I have absolutely nothing but great things to say about the audio on this release, and if you are able to make full use of the Atmos technology in your theater (or at least the 7.1 track) you will be left quite satisfied. I’m not sure I have had a better sound experience than with Guardians of the Galaxy Vol. 2 in 4K. The package I received was the standard 4K release, with a 4K disc, a Blu-ray, and a Disney digital copy. The embossed slipcover was beautiful, and the disc art was actually included on the 4K disc, something that too many studios overlook. 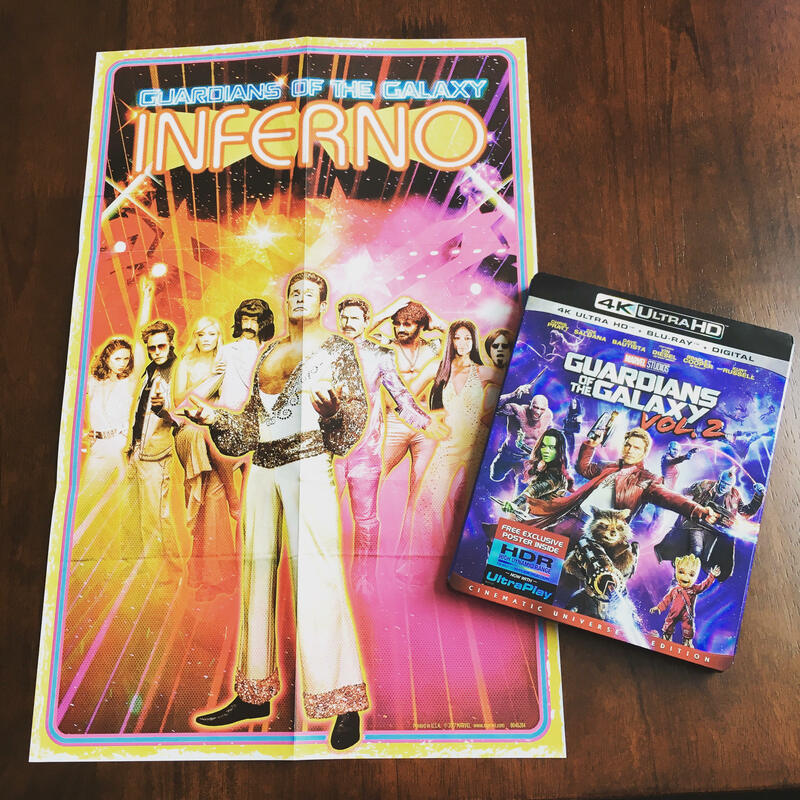 Also included with the standard release was a groovy “Guardians Inferno” disco-style poster, which plays right to the themes of the film, and also features a guest appearance from the one and only David Hasselhoff. It will certainly look great in any collection. I give a score of 3.5/5 because I did not particularly like the steelbook from Best Buy. When compared to the first film’s excellent cassette tape steelbook, this one was a letdown. Featuring baby Groot and the red button, it’s simple, boring, and does not speak much to the film’s themes. I would have preferred something more “70s” inspired, like the poster. Overall, you know you’re going to buy this! I highly recommend the 4K release because of the excellent Dolby Vision HDR, the 8K source material, and the color scheme of the film, along with the excellent Dolby Atmos audio technology. The standard release is probably the one I recommend most, since it does come with a poster (unconfirmed with the steelbook as of date of this review), and the embossed slipcover gives off a better vibe than the steelbook art. 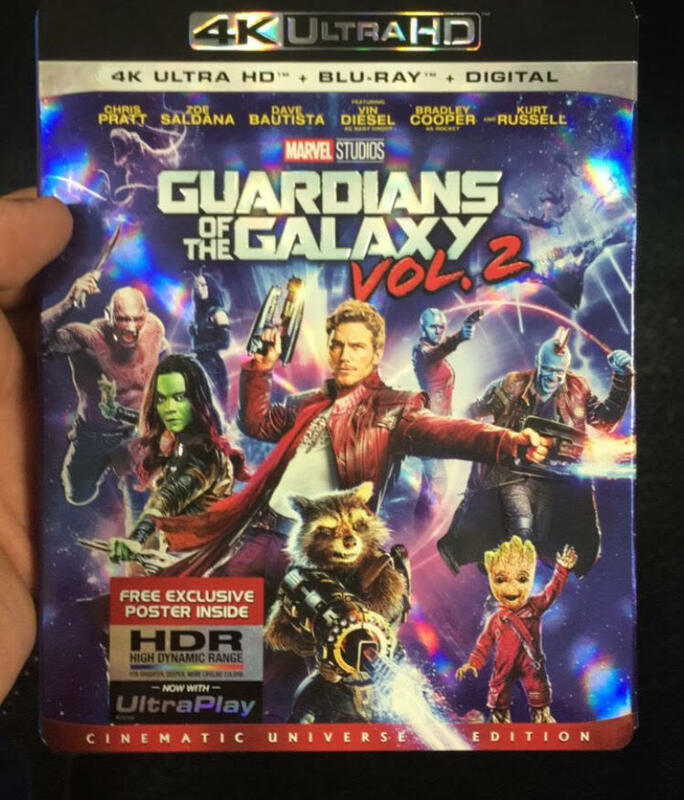 Guardians of the Galaxy Volume 2 will be available to purchase on 4K UltraHD and Blu-ray on August 22nd, and I do recommend it as a Day One purchase.